I originally wrote this piece with a start and ending that assumed Trump had lost (yes, I know), and re-wrote it after he had won. I mention that because I think an unfortunate consequence of that is that many will read this as another 'why did he win' piece. It is not that, It is more a 'how did someone who was openly despised by most Republican politicians (included past Presidents), who broke all the normal rules, and generally acts like the dictator of some poor country unused to democracy, get a clear chance at being POTUS' type of question. Whether he won or not is irrelevant to that type of question. Asking why he won is a whole different type of question, because you are looking at marginal shifts in the way people vote. His appeal to those in the rest belt who were adversely effected by globalisation is clearly relevant in that case. So the US has had its Brexit moment. Perhaps the lesson is that if people are promised impossible things and no one tells them they are impossible, you can motivate some potential voters to vote who would not otherwise have done so. But it would be wrong to get hung up on the polls: Nate Silver was clear that there was a good chance Trump could win. The question to ask is how could the United States elect to its most powerful office not just a demagogue, but someone who lied openly all the time, incited hatred against other religions and ethnic groups, and promised to lock his opponent up if he won. We have to ask how this could happen. They are remarkable, and they may explain some of the detail of how he swung votes at the margin. But, as Ezra Klein notes in an interesting article in Vox (written when he thought Trump would just lose), Trump support comes from people who are well off, do not live in areas hit by globalisation and are not in areas of recent immigration. They do not explain how a demagogue and liar gets to win so many votes. And they don’t explain how the chart above can lead to people electing a President who now almost certainly will cut taxes for the 1%. His explanation instead comes from political scientist Julia Azari, who writes “The defining characteristic of our moment is that parties are weak while partisanship is strong.” It is certainly true that the Republican party hierarchy failed to stop Trump, and that a great many of them then went on to endorse him. It is also true that Sanders, an insurgent from the left, did very well in the Democrat primaries. But there the equivalence ends. Sanders is no demagogue who lies openly all the time, incited hatred against other religions and ethnic groups (unless perhaps you count bankers as an ethnic group), and promised to lock his opponent up if he won. He is hardly a threat to the democratic process. The other problem is that the analysis does not spell out why the Republican base has become so extreme, and why plenty of people who are not so extreme will have voted for Trump. You can certainly say that this extremism was encouraged by Republican politicians before the rise of the Tea Party: think of holding the government to ransom when Bill Clinton was President. But I think the biggest factor missing from Klein’s account - as it often is by those in the media - is the media itself. This consists of two parts, much as it does in the UK. First there is Fox news: a highly partisan news provider with a clear right wing bias. Second there is an inability of the non-partisan media to provide any kind of counterweight when someone like Trump arrives, and in some cases provides help to his cause. I have talked about this second factor before, here and more briefly here, so let me concentrate on the first today. The story is in fact told better than I ever could by Bruce Bartlett, who worked in the Reagan White House and for George HW Bush, so I’ll just summarise it here. The story starts under Reagan, who provided pressure to withdraw the Fairness Doctrine, which was similar to what keeps UK broadcasters from being partisan. Initially that allowed the rise of talk radio, and then Fox News. Gradually being partisan at Fox meant misinforming its viewers, such that Fox viewers are clearly less well informed than viewers of other news providers. One analysis suggested over half of the facts stated on Fox are untrue: UK readers may well remember them reporting that Birmingham was a no-go area for non-Muslims. But why is this causal, rather than simply being a mirror on the rightward drift of the Republican base? The first point is that there is clear evidence that watching Fox news is more likely to make you vote Republican. The second is that, like the tabloids in the UK, this propaganda machine can turn on party leaders and keep them from moving left. The third is that it is also a machine for keeping the base angry and fired up and believing that nothing could be worse than voting for a Democrat. It is Fox News that stops Republican voters seeing that they are voting for a demagogue, conceals that he lies openly all the time, incites hatred against other religions and ethnic groups, and makes its viewers believe that Clinton deserves to be locked up. Just as UKIP (and perhaps now the Conservative party) is the political wing of the tabloids, so Trump is a creature of Fox news. Trump’s election is a disaster for humanity. That may be true in ways we can only speculate about, but we know that he does not believe in climate change, thinks it is a Chinese hoax, will not follow the Paris agreement and will do all he can to support coal. With a Republican congress no one will stop him. When you think about that, remember also that Fox news (like sections of the UK press) encourages climate change denial, and the issue was not mentioned by the non-partisan nightly news election coverage (which obsessed about emails) or raised in any of the presidential debates. If you continue to mislead people in this way, they will continue to make terrible mistakes when they vote. Your implicit characterization of HC as being relatively honest compared to Trump is laughable. HC is bought and paid for by the establishment - Wall Street in particular - and is the epitome of all that is wrong with US politics. I would not vote for Trump; he is indeed seriously flawed but, in my view, HC is far far worse. Your analysis of the media is also laughable. Of the main channels only Fox News was pro Trump; all the rest were pro Clinton; CNN was called the Clinton News Network and earlier this year two of their presenters, on air, said words to the effect: "well, we've done all we can for Hilary". The press were out and out anti Trump and the media in total aired every problem Trump had whilst playing down the mountain of problems that HC had. Trump had one huge advantage: he is not a politician. HC has "previous" Trump has none. She has made the innumerable shabby compromises that folk in politics are wont to do in the US while he hasn't been involved at all; he's basically your average scheister billionaire. He may well turn out to be a disaster but he has done a good many a favour already: he's poked a stick in the eye of the establishment. So why did the other channels spend so much time on the emails? Or were the emails not helpful to Trump? Check Politifact: 51% of what Trump says is false compared to 12% for Hillary. Of course, you will say that Politifact is corrupt, too. Can you elaborate on why you think HC is "far far worse" DT? It's a genuine question from a Brit trying to understand why many in the US hate Hillary. Thus far I've mainly heard "emails" thrown at me, but that seems weak compared to DT's known statements. I'd like some concrete examples. Also, as far as the emails, I prefer to stick to the principle that she's innocent until proven guilty. You should read what I said. I did not refer to whether what Trump said was true or false; I spoke about media bias which has nothing to do with that. As to the time spent on the emails just how much time are we talking about? The emails were helpful to Trump but that does not negate the point about media bias; it is merely one countervailing factor. Why is HC far worse than Trump? Because she has a proven record whilst Secretary of State of going after a fight in order to spread the message of "democracy", Libya being the obvious example. Her manifest trajectory was interventionist, despite the fact that it was not only unsuccessful but immoral. Would she change if she were POTUS? No: she'd just turn up the neocon volume generally; she was making noises about Russia and Iran even while the campaign was on. She was also a tool of Wall Street and the egregious and nefarious activities of that were never going to be addressed by HC. Trump has no previous; he has said he wants better relations with Russia and he has condemned the interventionist wars in Iraq and Libya. He has also said he will tackle the abuses of Wall Street. Trump may have feet of clay; we shall see. Clinton already has feet of clay and she would get no lighter by being POTUS. Farage was unelectable in any of the 650ish constituencies with media help, then could ride to a 52% poll Leave with that help. I wrote yesterday about the BBC's woeful reporting on the General Strike on 1926. i forgot to say that what sparked the government into action was the printers union refusing to publish the Daily Mail. What Murdoch and Trump have in common, unlike Stalin and Hitler, is that they are both upper class. The dictatorship of bigotry starts 2016. It isn't just the mainstream news that misleads. Online news sources, which are increasingly read, are considerably worse. Even the merest pretence of balance and journalistic good practice goes out of the window, and all manner of far-fetched conspiracy theories are broached. There was an incredible notion at the weekend that Clinton and Podesta engaged in human sacrifice, all based on some wildly out of context leaked emails. It is going to get worse as time goes on. Today I am incredibly despondent. The only thing I can say, not a counter, is that Hillary Clinton did win the popular vote, but not on a state by state basis, which is how the Electoral College works. Plus, there is likely a suppression of votes for her on the part of a fair amount of the electorate because of gender bias, just as President Obama's total vote was suppressed somewhat by racial bias expressed in voting. But this time, at the state by state scale, it could not be overcome. Clinton’s rejection rates have been extremely high for a long time. How could the Democratic Party establishment push through the nomination of the most establishment/insider candidate at least since Al Gore back in 2000 when the country is crying out for something different? Anything different. Sanders attracted tremendous enthusiasm amongst the young and well-educated. He was the outsider from the left that could have defeated the outsider from the right. But no, Sanders was lambasted and demonized by the liberal elites and Clinton was idealized with almost religious fervor as the most qualified, most experienced, most you-name-it super-candidate which she never was. 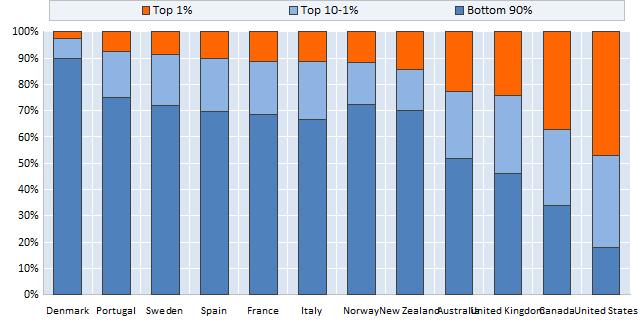 In your bar chart of the income inequality of 12 countries, the top five places are held by English-speaking ones. Good piece with much to commend. I'd take slight issue with your analysis of the Democrats and Clinton's profile. You let them off too easily. Sanders showed that there was an alternative but the party, like so many former parties of the centre left, has been captured by those you allude to: defensive, negative campaigners determined to appease corporate conservative America at all costs. Understandable for the reasons you adumbrate, but it makes for bad politics in 2016. I really can't understand why you have made the argument in your blog that you have. Just as you struggle to understand why a majority of the British people voted for Brexit you cannot understand why Trump prevailed. The chart you have posted is stark explanation enough. Your blog would have done well to end there. Paul Ryan, leader of the House in the US Congress, claims Trump heard a voice that NO-ONE else heard. I think he is correct. Clinton failed to hear this voice. She was arrogant and took the people of the rust belt states for granted. (I believe she did not visit these states once after the Democrat Convention.) These people have suffered the most because of the effects of globalization - I don't have to tell you this - just as the Brits that voted for Brexit have suffered because of globalization. Enough of these people in the rust belt states (Democrat in the last election) deserted Clinton for Trump to cause the result we have. Another oddity of US politics is that the redneck working class of the southern states consistently support the Republican party. It's not just the elites. (Read "Dear Hunting With Jesus" by Joe Bageant if you haven't already.) Despite being used as economic fodder by the Republican Party/elites these people keep coming back for more. I think you might profit more from examining why Clinton lost than why Trump won. Hearing the voice is good. It's what do when you hear the voice that matters. Trump's decisions on how to use his privileged info could be, let's just say, concerning. Sanders may have heard the same voice, but his answer was very different. "..promised to lock his opponent up if he won". Well shock horror: that's because it looks very much like she is guilty of serious criminal offences!!! So we can forget about conducting proper judicial process and that silly idea of trial by jury, and 'innocent until proven guilty', such that the presidential candidate can promise to loch up his opponent in jail? 'Looks...' Don't you mean 'looked', given the FBI have said there was no criminal wrongdoing? I expect like the rest of decent society you're horrified at the now real prospect of a racist, nationalist, misogynistic demagogue who exhibits clear symptoms of being afflicted with narcissistic personality disorder being in the White House, at the head of the most powerful country in the world...a country built by immigrants. Name one! Mishandling classified information is not a criminal offense, only knowingly exposing it (like General Petraeus) is illegal. Don't give me any crap about Bengazi. Running the US is an insanely difficult job and horrible things happen. Seven investigations by REPUBLICANS have found no criminal activity. Now, self-dealing from your Charitable Foundation is a crime. Sadly, Trump is obviously guilty of this while Clinton's apparant self-dealing have turned out to be nothing so far. Like my post above, can you elaborate on why you think HC is guilty of serious criminal offences? It's a genuine question from a Brit trying to understand why many in the US hate Hillary. Thus far I've mainly heard "emails" in response, but that seems weak compared to DT's known statements. I prefer to stick to the principle that she's innocent until proven guilty. Very interesting. Trump's victory seems extraordinary but if you consider Raymond C Fair's model prediction and Larry Bartel's contribution in the 'Monkey Cage' the outcome seems less extraordinary: As usual, 'Its the fundamentals stupid'. What lessons can we learn for the next UK election? It turns out that when the majority of the country are so disenamoured with the entire political-media establishment, that being considered an "unelectable outsider", derided by the media and briefed against by his own party was a recipe for unstoppable electoral success. Basically, Clinton lost because too few voters got off their backsides and voted for her. The numbers confirm this. Discuss. With all the analysis and hand wringing in the US, few recognize the root cause that you identify here. Roger Ailes has done more damage to this country than any socialists or communists ideology, and it shows the powerful effect of propaganda on a population. Fox News has dumbed down a nation and now we are paying the price. The perceived self-elitism is strong in this one. I am a careful reader of you and Krugman's work and mostly believe in the Keynesian economics arguments you propose but I have had hard time accepting Krugman's praise of Hillary and now your argument for her. Hillary Clinton lost rust belt states that have traditionally voted for Democrats and can hardly be considered as racists. That is up to Trump's success as much as HC's failures. At a basic level you are asking for people to put more importance to Trump's offending remarks rather than Hillary's past of flirtation with special interest and big money groups. I don't understand Trump's mistakes are more pronounced than her's. She has sold out the people that she claims to represent and yet somehow was given a total free pass by the media, yet you find the media as the large problem. Trump support comes from the well off? What a mistake. Trump support comes from some of the very well off, and by some of the surviving middle class feeling the risk of huge downward mobility, and that latter element is what allowed him to win. Not because they voted him, but because they refused to vote for Clinton. The geography cannot be clearer. Traditional democratic bedrocks lost to Trump because of decreased turnout. Also, how can you still stick to the view that economic issues simply do not matter, or perhaps matter only in a normatively inconsequential way through people not being educated enough to avoid being brainwashed. This is exactly the kind of lurid elitist attitude that the "neoliberal" generations of center-left voters all across the West are displaying with respect to the older generations, which is hugely mistaken and likely the single most important source of the hemorrhage of votes from the left. You quote these guys -vox.eu articles of people faking nonexistent expertise- instead of the NBER paper of Autor et al. on the trade effects. Look at the map in that paper, and the one tracking pro-Trump swings. They are almost identical. And stop reading sophisticate charlatans at Vox, for god's sake. Yeah, Trump has his well off supporters, especially in wealthy reactionary suburbs like Olmos Park outside of San Antonio, Texas. But by themselves, I doubt they could have carried Texas, let alone the election. An excellent and lucid analysis. Is there any example of a fairly objectively successful* prime minister, president or leader of a country in general which came to power as dubious self-made man happy to insult pretty much everybody which doesn't share his view? I so far can only come up with negative examples. Hopefully things turn out not quite as bad as it seems today. "So the US has had its Brexit moment." Nope, it had its Corbyn moment, but on the right. As Py @ 05:03 yestrday said, who in UK was "that being considered an "unelectable outsider", derided by the media and briefed against by his own party was a recipe for unstoppable electoral success." While Corby energised many dissafected voters, his own party did everything not to allowed them in and bring electoral succes at the next elections. Those that left betraiting Labor wannt to return to it due to Corbyn leadership which would bring much needed votes to next election, but Labor doesn't wannt to win with left voters, they want to winn with right voters. Your "share of income growth" bar-chart revealed that, in four of the five English-speaking countries which took all the top places in the league of twelve, their top one percents pocketed anywhere between around 20% - 50% of the income growth. At the other end of the league, in Sweden and Portugal they pocketed about 8%, and in Denmark, at the bottom of the league, they pocketed 2%. What is it about English-speaking countries that their populations are so crushed that they allow the wealthy to take so much of the wealth? Is it their right-wing media and the sea of right-wing ideas in which their population swim? That might explain this quote from, I believe, John Steinbeck which goes something like this: "The reason socialism never took hold in America is that so many people there regard themselves as temporarily distressed millionaires." With growing perspective, an alternative scenario seems plausible. Trump takes office, and faced with GOP controlled congress, goes native with "mainstream" GOP policies, tax cuts for rich, big defence boost, global trade is barely impacted, only token wall with Mexico, token immigration controls, and deficit fetishism. So, infrastructure spending is limited. Jobs don't come home. Incomes stay depressed for lower and middle families. 1% makes hay, but trickle down still didn't work. Life doesn't change for most Americans. After 3 years, Trumpites get restless, realise lyin' Donald Trump was as much part of the hated establishment after all. Can Democrats field a credible POTUS candidate, AND get control over congress, to start to fix the American economy? Just trying to be optimistic, but it might happen, because the Donald just can't stop lying, and playing to the audience, and his new audience won't be political rallies, but aggrieved GOP politicians. Do New Keynesians assume full employment? Is austerity to blame for Brexit?